Genetic hair loss may affect both men and women and usually starts in the 20s or 30s. Genetic hair loss first causes the hair follicles to become thinner and thinner over time (‘miniaturized’) before they are ultimately loss. Treatments for genetic hair loss are different in men and women but include topical minoxidil, oral hormone blocking medications and hair transplantation. Alopecia areata is an autoimmune condition and affects 2 % of the world. Alopecia areata may cause hair loss in adults or children. If all the scalp hair is lost, the condition is called alopecia totalis and if all the scalp, eyebrow, eyelash and body hair is lost, the condition is called alopecia universalis. Treatments are more successful for individuals with smaller areas of hair loss (patches of alopecia) than for individuals with alopecia totalis or universalis. Traction alopecia is more common in women than men and occurs when the hair is pulled back tightly causing it to break off. Women who wear their hair tight in ponytails or wear braids or extensions are more likely to develop traction alopecia. If the traction alopecia has been present for short periods of time the hair will grow back. 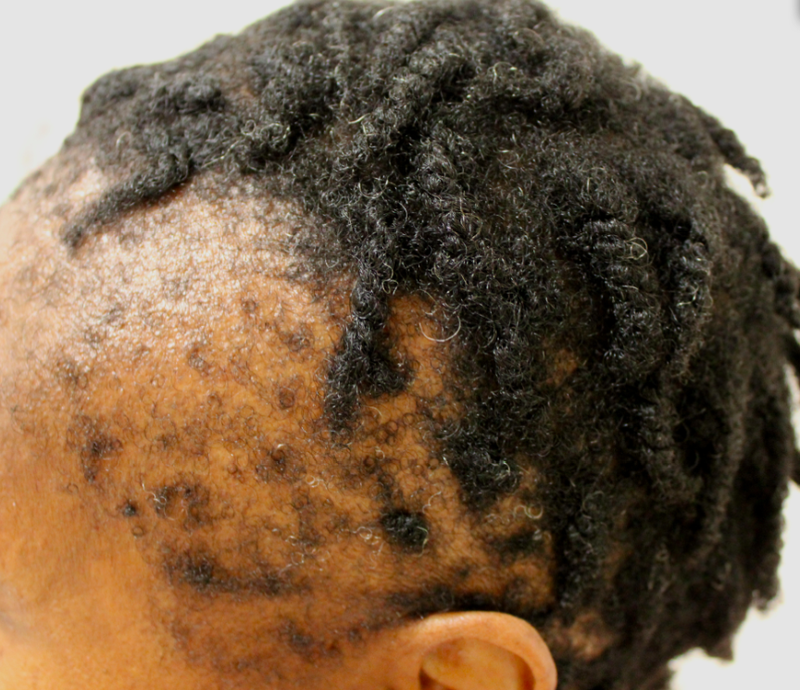 Long-standing traction alopecia may lead to permanent hair loss. Trichotillomania refers to self-induced hair pulling. Individuals with trichotillomania pull out their own hair, which can be scalp hair, eyebrow hair, eyelash hair of body hair. Approximately 1-3 % of the world will have trichotillomania at some point in their life. If the pulling of hair is stopped in early stages, hair may grow back. Long standing trichotillomania leads to permanent hair loss. Scarring hair loss conditions are rare but include a number of conditions whereby activation of the immune system leads to permanent hair loss. Treatments are available to stop hair loss, but regrowth is usually not possible once the scarring happens. About 60-70 % of individuals receiving chemotherapy for cancer will develop hair loss in the first few weeks after their chemotherapy. Hair grows back within 4 months. Some chemotherapy drugs, such as taxanes, cisplatin and cyclophosphamide have a very slight chance of causing hair loss such that a full regrowth does not occur. This is known as permanent chemotherapy induced alopecia. Fungal infections can cause hair loss and this is more common in children than adults. Treatment with anti-fungal pills rather than antifungal creams is needed to treat fungal infections.